I've been a fan of copper cookware "forever" and in my early married days bought a $19.99 set (for display only) because I thought a kitchen needed copper!!! Gosh, how naive was I!!! 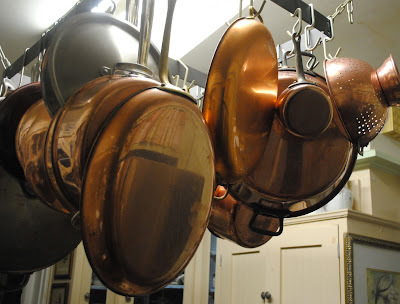 As my purse got fatter and my cooking skills got better, I realized that copper was to cook with -- not just for display and so began my quest for copper cookware. The $19.99 set was donated long before I began my copper collection. I realized that it was poor quality and a poor choice. Over the years, I've bought a piece here and there -- Estate Sales are great places to find copper and Tuesday Morning and TJ Maxx have been good hunting grounds as well. I prefer French copper, but not all of my copper cookware is French. But the price has to be right! Alas, I've passed up many great pieces because they were too pricey for me!!!! 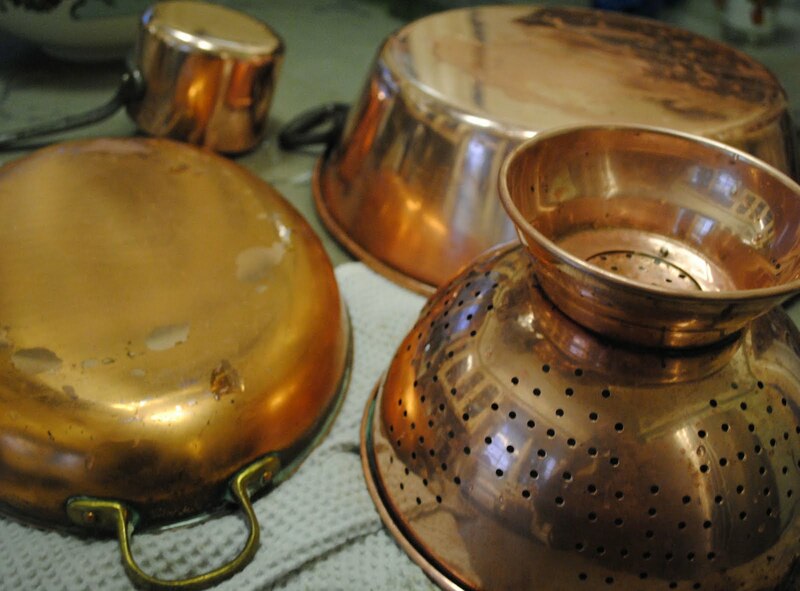 But with copper cookware comes the chore of polishing the copper. Last year, with surgery and all, it didn't get polished quite as much as I'd like. This morning, the copper looked like this! Alas, at least a year's worth of tarnish (I think the last time I polished all of the copper was last January because we were having a houseful of company to celebrate a birthday). 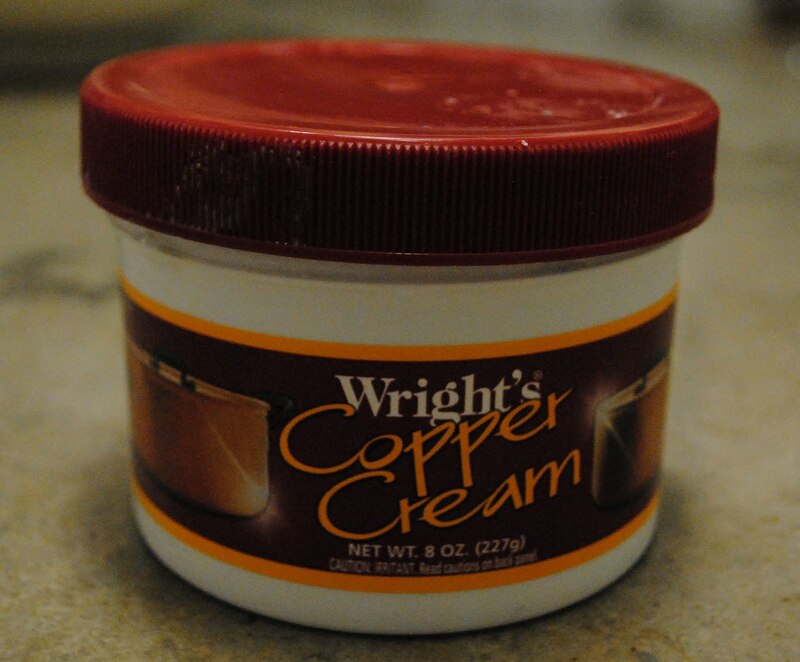 I do polish it whenever I use it, but alas, not all of the copper is used even monthly! Polished copper on the island waiting to be dried and rehung. A casserole, my colander, a jam pot (which is polished on the inside as well as the outside!) and a wee pan for melting butter. It actually doesn't take all that long to polish everything. And I really should do it more often and perhaps in 2011, I will!!! For I love the sheen and glow of the freshly polished copper. It adds a great sparkle to the kitchen! January is always housecleaning -- a total cleaning from basement to attic and today was spent in the kitchen which is why the copper got polished! Tomorrow is the dining room which, alas, has all of those silver napkin rings and the tea set and some candlesticks. It doesn't take a crystal ball to see that tomorrow will also be a polishing day as well!!!! WoW! Look at that lovely shine to your copper pots and pans! Don't you just love winter on the prairie...time allowed to do some of the things we put off during hurried times! I, too, did some basement cleaning today! Donated six large boxes of items not used to our local Thrift Shop! The ladies were ohing and ahing before I could get the boxes out of the car! HA! Keep up the steady pace and that lovely Linderhof will be the shining jem of the block (perhaps the town!)! Haha... I had that cheapo copper when I first got married tol - what a waste of money. I was going to mention ketchup, and tomato sauce as well. Schmear it on, let it sit overnight, and rinse. Actually, I like my copper unpolished - not green though. Looks more loved that to me. And yes, French copper is wonderful. Polishing copper always has seemed so satisfying to me. It makes a huge difference so quickly. Your copper pots and pans look wonderful hanging up there! I love the look of polished copper, brass and silver. There was a time when I did it all on a schedule, so that everything gleamed all the time. Now it gets done when I notice that there's tarnish, or if I'm having a party. I love your copper! It looks so lovely all polished up! My Mom has a copper collection and I have always loved the stuff! I am in a January cleaning and organizing frenzy too so am inspired by your polished copper. Your dining room has me mesmerized. Everything in it is so beautiful. Wow! It looks great. I just have a a copper bottom skillet. It doesn't shine much anymore. I love my copper pots and pans as well. And I love the french pans the best!! I am going to be looking for the WRights polish now. I use their silver creme as well since it is actually gentler on silver than many others.. thanks for the inspiring post.. Maybe I will be polishing this weekend! 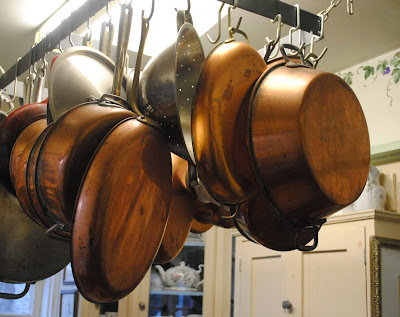 Your copper pans look great, Martha. Sounds like you're having a thorough pre-Spring clean! I am thankful to you because your article is very helpful for me to carry on with my research in the same area. Your quoted examples are very much relevant to my research field.